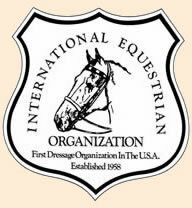 The International Equestrian Organization was America's first dressage club and USDF's oldest GMO. The late Lilian Wittmack-Roye founded the Pennsylvania-based IEO in 1958. Roye, a native of Denmark, immigrated to the U.S. in 1949 on a one-year contract with Ringling Brothers and Barnum & Bailey Circus. After her circus career ended, Roye settled in York, PA, and established a training facility, Bri-Mar Stables. Told, "Nobody wants a dressage show," she proceeded to put on her own, a groundbreaking competition held at Bri-Mar in 1955. The IEO went on to host what some believe to have been the first CDI in the U.S., in 1976. The IEO also hosted the first AHSA recognized dressage show. The object of the International Equestrian Organization as a non-profit, educational organization is to promote among its members and the public a better understanding of horsemanship with an emphasis on Dressage. The IEO sponsors competitions and other activities for the purpose of furthering the art of dressage.